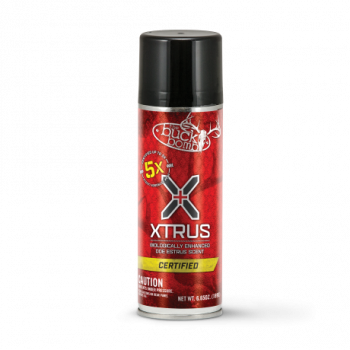 If you're looking for an extra advantage in the deer woods, look no further than Buck Bomb Xtrus! Each batch of Xtrus is lab-tested and certified to contain estrogen levels up to 5X natural estrogen levels found in does during peak estrus. Xtrus contains maximum estrogen levels which are collected during a doe's peak heat period, using a new patent pending deer urine collection method which provides fresh, peak estrus urine for extended periods of time. This extremely powerful deer urine scent attractant can be used to draw in bucks looking for a hot doe that is ready to breed. Each can of Buck Bomb features the NVERTR 180-degree ball valve that allows it to be sprayed in short bursts—even upside down. Or, lock down the valve and empty the contents all at once to unleash a potent cloud of scent that can travel in excess of a quarter mile on a 3 mph breeze.